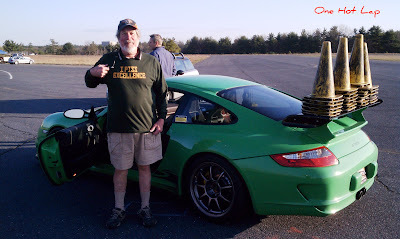 One Hot Lap: One More Practical Reason to Own a Porsche 911 GT3 RS! 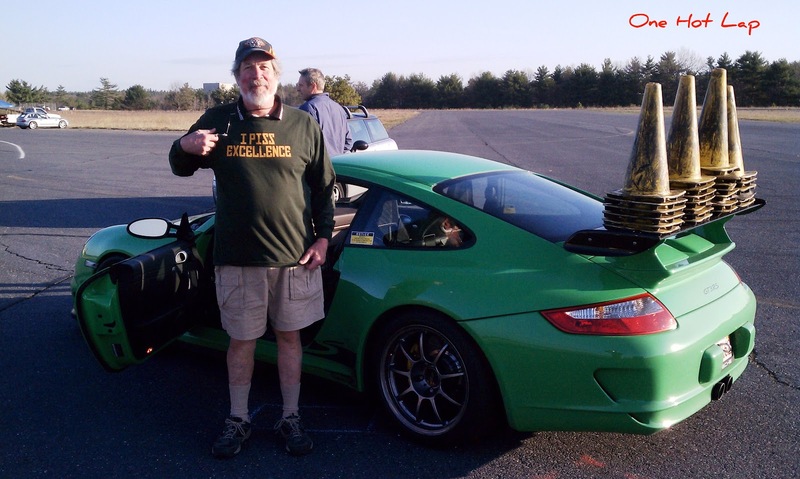 One More Practical Reason to Own a Porsche 911 GT3 RS! The 911 GT3 RS doubles up as an autocross van. Maybe this setup is designed to add more traction over the drive wheels? Maybe it's a new aerodynamic aid like a reverse cone diffuser? A new design that combines better weight distribution AND aerodynamics? "It is I who pissed all this wing design excellence!" Hahaha.. That's an epic picture!! Scruffy, you made Jalopnik. You are instantly famous! You missed how he removed said conage. He drove 1/4 mile down the runway, got to the "disembarking zone" and blipped the throttle. Steven "Scruffy" is one of our autocross course designers extraordinaire... on so many levels. Rumor has it that Scruffy irons his trousers, filets striped bass, serves sashimi, and allows his French bread to rise on that thing as well.. Some say, one of his kidneys has "GT3 RS" incised onto it. For all we know, he's Scruffy! I didn't mention that he breeds award winning show Tirolean guinea pigs on that spoiler as well. No waxing required. Oh wait, now I did. Why would you assume he's wearing trousers during the breeding session? Yeah, the male of the species prefer a good Brazilian, or so I hear. Porsche Multi Use Wing, or PMUW. No way I would put those filthy cones in my car. Once cleaned tunafish salad from the PMUW after using it as a lunch table. Whatever it takes to get the job done. Fearless Leaders demand that the course be done on time or I will be put on corner 17 in the Oxbow forest without a radio. Yes, the punishment for a late course design is corner 17 of the Oxbow forest without a radio, water or food for two shifts back to back! 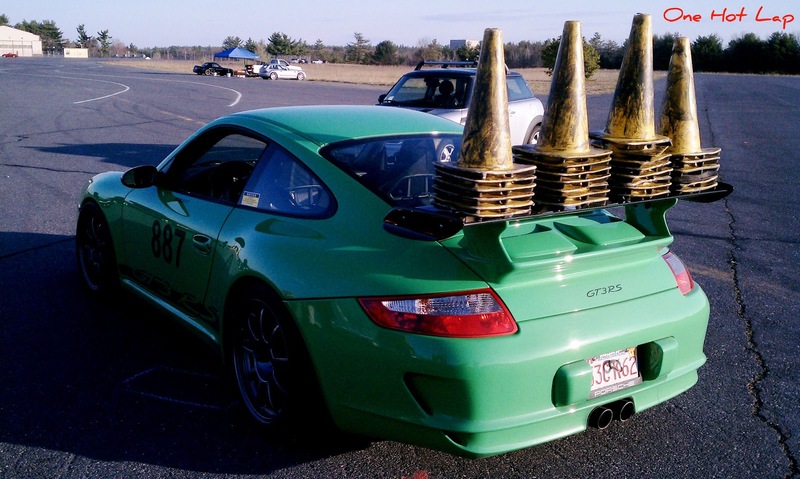 That's why it takes a 911 GT3 RS to deliver the cones fast enough to each section of the 1.5 mile course! Hey Crouchie!!! Made gallons of Cap'n Scruffy's rum punch over the holidays, and finished the last of that stinky sausage just last week. I single-handedly destroyed half a gallon of Cap'n Scruffy's rum punch over the holidays - it was absolutely DELICIOUS!! I'd run a moonshine operation to get that stuff! And what was that secret ingredient that you so carefully peeled in, Scruffy? I tried to imitate that rum punch on my own and it just didn't taste the same. And wait, what? You never said no nothing about a stinkin' sausage you've had sitting around for half a year. Calling the TSA right now, buddy! French Canadians Invent the "Leapfrog Pass"
Human Sounds as Good as a Real Race Car!